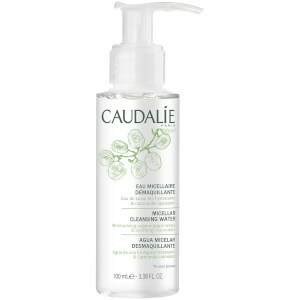 Remove impurities from your skin with Caudalie Micellar Cleansing Water. The micellar water attracts dirt like a magent, gently yet effectively removing it from your skin without rubbing or causing irritation, to provide an intense cleansing action. I bought this as a pre-cleanse make-up remover, it contains quite a strong fragrance so not sure exactly how natural that is, but it does smell nice and takes off eye makeup without any stinging or redness. It leaves the skin hydrated and ready for a deep cleanse with a wash off cleanser like Oskia Renaissance. 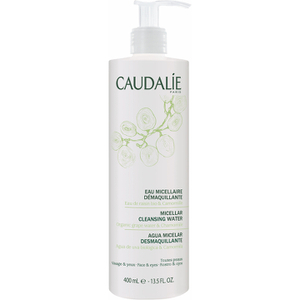 Very gentle cleanser, great at removing all makeup and smells lovely and fresh. I love this and have been using it for scopula of years without fail. A good product with no drying effects. this is the best make up remover / cleanser ever - so fresh and fragrant and super effective. ive tried so many other brands and this is the only one that leaves my skin feeling clean, fresh and nourished. lovely. This is the best eye make-up remover lotion that I have very used. I have used so many in the past that have always left my eyes stinging but not this one. I would never use anything else. My skin was on fire the first time I used this! I have tried so many products but I never had one that would literally inflamed my skin so badly it got red and itchy and tingly and it took forever to calm it down. Not sure what kind of chemicals they use in this product but I would not recommend it! My skin isn't hyper sensitive so it's definitely the product! This has been the best product I have bought as a cleanser so far. I used to have bad skin around my oily T zone, but since using this it has completely got rid of any breakouts. It also does not over-dry and I do not need to use a night cream after cleansing. Considering how long it lasts the price is also very reasonable! The only con I would say is that sometimes I think I need to use it around 3 times to properly feel like I have cleansed away all make-up traces - other than that it is great and I will probably never change to a different cleanser! I really cannot rate it enough - I even get comments all the time on how much my skin has improved! I normally do not wear heavy make-up on weekdays, but still need to use make-up remover as I use sunblock with 50 SPF. This is a perfect product, which leaves my skin clean, fresh and moistured. More importantly, it is gentle and affordable for everyday use. Just love it. Stock up!!!!!!! !